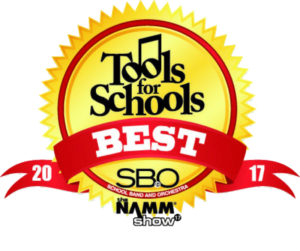 Every year at the NAMM Show (the National Association for Music Merchants), representatives of School Band and Orchestra Magazine walk the show floor filled with tens of thousands of new music products, looking for companies and products that stand out as “best in show”. This is not a nominated or popular vote designation, but a juried honor presented by experienced music educators. This year, the panel of 6 expert music educator jurists who selected the companies and finalized their decision, during their spirited evaluation process, determined 8 fine products to be “best in show” for making educators’ job teaching music easier, innovative and fun. There are a number of categories that they are looking to award products in, including Best Teaching Tool for Beginning Students, and Most Innovative Teaching Tool. 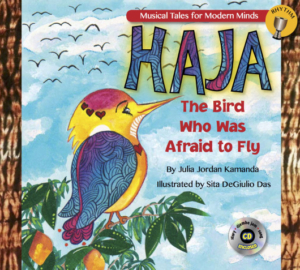 This year, Haja, The Bird Who Was Afraid to Fly, was awarded with an Honorable Mention for Preschool Students! I believe very strongly that a deep love for music starts with our youngest musicians. For this book to be recognized as a Best Tool for School by such a prestigious magazine is an absolute honor and, honestly, a very validating experience. I can see that my product is making a difference for people and I’m humbled by the overwhelming support the books have been getting. Thank you to SBO Magazine for the recognition! And congratulations to the Musical Tales for Modern Minds team including the incredible book designer Raul Rodriguez at RstudioT, multi media illustrator, Sita Das, and executive editor, Sandra Kilpatrick Jordan. Haja is available for purchase at Amazon.com.